Space Shuttle Full Fuselage Trainer - this is perhaps the closest a random member of the public will get to going inside a Shuttle. Fascinating exhibit at the Museum of Flight, Seattle. Of course I took photos. Not to be confused with Le Shuttle! 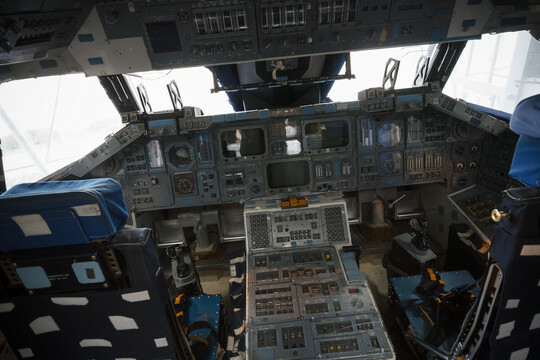 Space Shuttle Orbiter Tour - Flash-based interactive panoramas through the shuttles and associated infrastructure. I went looking for such imagery when wondering quite how similar the Shuttle trainer was to the real things - the answer is very. The real shuttles are a bit less worn, but here you can experience the space-going scuffed paintwork, scratches, bits of duct tape and velcro patches everywhere. Gravity film trailer - perhaps not live footage of NASA's recent emergency repairs to the International Space Station, Alfonso 'Children of Men' Cuarón's upcoming film definitely looks positively splendid. I really, really hope everything else holds up - there could be ... interesting orbital mechanics involved with going from a Hubble Space Telescope service mission (on the Space Shuttle Explorer, no less) to the International Space Station (involving a parachute-deployed Soyuz and a neither-an-Orlan-or-a-Strizh spacesuit). Someone's definitely done their homework in creating fictionalised versions of real-world space hardware. But the physics? My nice view had an apartment block built in the way. Chris Hadfield's Snapshots from Space - happen to find yourself in space with a dSLR, some long lenses and want to take some nice pictures? Here's some handy advice. Jammy git. GeoGuessr - fun exploration game involving Google's Street View. You are placed in a random location. Can you place yourself on a map? I occasionally get the right continent. Even more occasionally the right street.